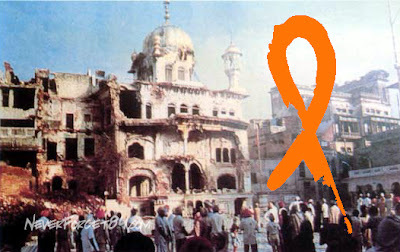 We move on now, to June 5, 1984, with more events and eyewitness accounts, including an interview with Pritam Kaur, wife of Sant Gianai Jarnail Singh Khalsa Bhindranwale's P.A. I tried to make my profile portrait your picture with the orange ribbon, but blogger wouldn't. I have put it on my blog's header. Is this one OK, do you think? Are you going to repost the story of what happened to the three of you in Amritsar at this time? I think you should. I remember when Maman called us and told us about that, I totally freaked. I'll e-mail you a copy of the letter Sandeep wrote me. I know you'll want to see it! It is really weird how sadly even seemingly literate people get emotionally charged to support wrong causes. Pity. What happened on Operation Bluestar is sad, particularly the death of innocent devotees. But one has to remember it is the terrorists that brought this tragic event to come to pass. Terrorist is a slippery word. I assure you that I am wide awake.